The New Brampton Community Task Force hasn't added a story. New Brampton is a group of passionate Brampton citizens and business people, who have come together to form a task force whose intention is to be the catalyst for positive change and growth in the city of Brampton. We intend to help transform Brampton into a city which will deliver an excellent quality of lifestyle to it's citizens so that they will be able to live, work, and play in this city and proudly refer to it as "home". Further, Brampton will develop itself globally as a world leader in technology, industry, education, and Human Resources so that regional and international industries and entrepreneurs will also call Brampton "home"
Brampton is the 9th largest city in Canada. However, infrastructure growth and progress has slowed, if not stopped completely, in the city. Brampton deserves better - we have a thriving, well-educated population, without the infrastructure elements sufficient enough to support this population. This is a critical time to effect positive change in this city. The City of Brampton will shortly be making some crucial long term decisions; for Brampton to perform efficiently given its location and economic context, these elements have to be put in place in a timely way, or else time will pass it by. Consider a small donation of any sum you are comfortable with. Go to our website here, to see, learn, and share our vision with your friends and family. Declare your support by signing our petition here. 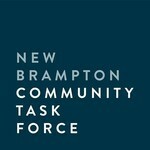 The New Brampton Community Task Force hasn't posted any updates yet. The New Brampton Community Task Force is managing the funds for this campaign.